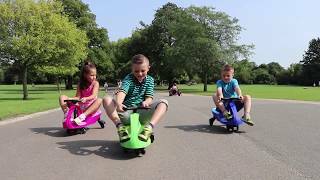 The boppi Wiggle Car has no pedals, but is all fun! Simply twist the steering wheel left and right to propel the car forward using natural momentum! The six wheels give a smooth ride and the steering is super responsive. The large seat and a maximum weight restriction of 75kg (11 stone) means your child gets years of fun out of this durable ride-on car, which has won both the Parent’s Choice Award in 2012 and the Totally Awesome Award 2013. The bopster Wiggle Car is available in a wide range of vibrant colours.